Whatever your political views and party affiliations may be, I think we can all agree that there is something significant about Bernie Sanders becoming the first Jewish-American to win a presidential primary. And it serves as a reminder that there is something special about Jewish leadership. I hasten to add that there is nothing extraordinary about the fact of Jewish leadership. Not in a tradition that includes Moses, Aaron, and Miriam, followed by the likes of Joshua, Deborah, and Gideon. Our models of leadership include prophets and priests, and the kings of Israel and Judah, not to mention Judah Maccabee and Queen Esther. For most of the history of the Diaspora, rabbis served as leaders of their communities. And for the better part of seven decades, the State of Israel has given us uniquely Jewish presidents and prime ministers. Jewish congregations, synagogues, and temples have also required members of local Jewish communities to step up and take on leadership positions, as trustees and officers. I'd like to call upon you now, taking a page from John F. Kennedy, to ask not what Adas Emuno can do for you, but to ask what you can do for Adas Emuno. We have room on our Board of Trustees for a few more members, and there is always room for more on our committees. 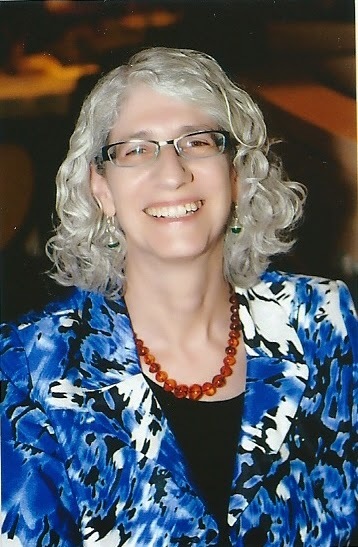 Virginia Gitter is the head of this year's Nominating Committee, so please contact her, or me, or any member of our board, or our clergy, if you are willing and able to serve. Leadership is not some magical power you can only be born with, not some mystical skill acquired through arcane means. It's simply a matter of service, being willing to serve on behalf of others, to lend a helping hand. Won't you consider lending yours in the service of your community, and your fellow congregants? 1. Leadership begins with taking responsibility. 2. No one can lead alone. 3. Leadership is about the future. 5. Leadership means believing in the people you lead. 6. Leadership involves a sense of timing and pace. 7. Leadership is stressful and emotionally demanding. Are you willing to take responsibility for our congregation? Not sole responsibility, we all work together, but are you willing to join with others in taking on that responsibility? Are you willing to work together for the sake of the future of our congregation? Are you willing to join together in what is a continual learning process, as we meet the changing needs of our community, county, and country? Giving of your time and effort is not without its rewards, which includes personal growth—it is indisputably a learning experience for everyone involved. Do you believe in our congregation, in our families, our children, our membership? Is this the right time? And if not now, when? And let's be clear about it. It's not always easy. To give to others means also to give up something. And yes, leadership can be stressful, demanding and draining, but as Teddy Roosevelt put it, "Nothing in the world is worth having or worth doing unless it means effort, pain, difficulty." But I also hasten to add that, for the most part, things run pretty smoothly here at Adas Emuno, so there is not very much stress. And there is a great deal of satisfaction. Jewish leadership is part of our heritage, something we share and can all take part in, as a duty, an obligation, a mitzvah. And you don't have to campaign to be President of the United States, after all. You just have to be willing to join together and lend a hand. No, I‘m not talking about the leader of the free world, but the president of our shul. It’s not every day that a rabbi writes about his president, but Lance Strate is so talented that I’m moved to do so. What other Temple president enlivens announcements with a witty comment on my sermon week after week? What other Temple president writes a Temple blog complete with links to entertaining YouTube videos? 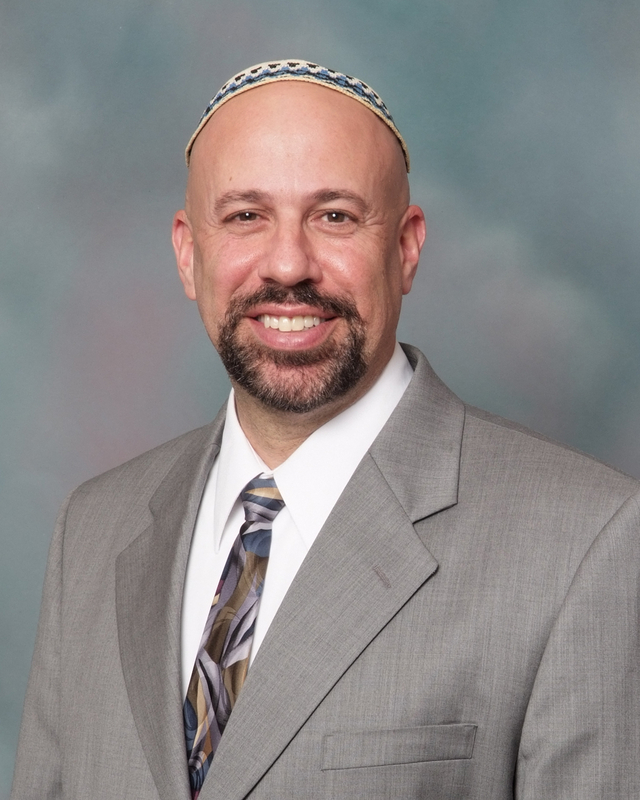 What other Temple president writes a column for the local Jewish newspaper (see the Jewish Standard for his latest, Zayde for President) that offers provocative commentary on the media and current events? What other Temple president convenes a monthly “Poetry Garden” that includes readings of his own charming verse? What other Temple president writes his own Purim spiels, including last year’s off­-off-­Broadway hit The Schnook of Esther and this year’s Shalom Shushan? The latter premiers in its entirety on Wednesday evening, March 23 at 7:00 pm­ don’t miss it! What other Temple president has not only written several books, but contributed to a new one with his rabbi? You can find both our pieces in Touching the Face of the Cosmos: On the Intersection of Space Travel and Religion (which you can find by visiting my Amazon authorpage). And look for information on a temple program about the book on Saturday, April 9 at 10 AM in a future post. What other Temple president manages to do this while juggling more than his share of family responsibilities and a professorship at Fordham University? Lance is completing his second term as Temple president, and without term limits I do not know if he will remain in office or anoint a successor. If the former, we will continue to benefit from his dedication and wisdom. If the latter, then may this column serve as a word of gratitude and appreciation. And let’s remember that the talents of our volunteers run wide and deep. Whether on the board, on a committee, in the school... in a small congregation such as ours, your contribution makes a difference. My highlighting our president is really a salute to all who lend a hand in sustaining our special community. Purim is coming, so in the true tradition of the holiday... let's fill a "community" Shalach Manot basket! When you attend the Purim service and festivities, please bring a nonperishable food item (or two or three) and place in the basket in the vestry room as you enter the sanctuary. Food can be brought on both days of the celebration (Sunday, March 20th and Wednesday, March 23rd). These donations as well as all food items collected through the end of March will be delivered to the JFNNJ (Jewish Federation of Northern NJ) for their March Mega Food Drive. Thinking ahead... we will be collecting all leftover, unopened Passover food during the first three weeks in May. It will be brought to the Helping Hands Food Bank in Teaneck. A special box will be placed in the vestry for these donations. 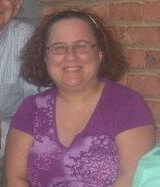 Wednesday, March 9th the Social Action Committee met at 7:30 PM in the Social Hall. ­Our social action projects have been successful due to the incredible responses of our congregants, whenever called upon. In essence, you are all members of this committee! During this meeting members brought in new ideas, discussed the old ones and welcomed those who "never knew we existed" as a group. Couldn't attend? Just email your ideas to me. Thanks! Thank you to all who donated to the Winter Clothing Drive. Items were brought to the Council of Jewish Women's thrift shop in Bergenfield. The general food, household items and toiletries collection is ongoing. It’s holiday season! Not the kind where you get lots of presents; rather, two important Jewish holidays are coming up in March and April–Purim and Passover. 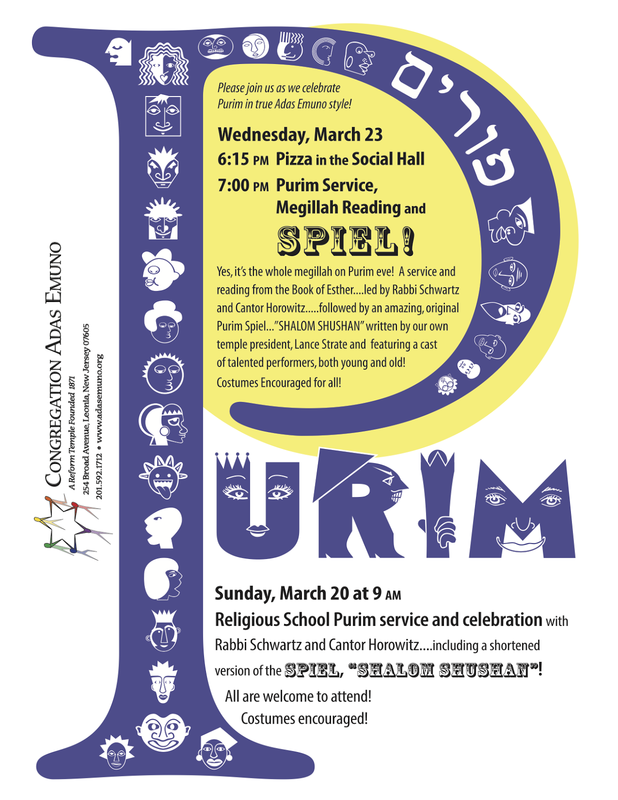 Our Religious School Purim celebration is Sunday March 20th. It’s “Silly Time”! Children are invited to come to school in costume, as one of the characters from the Purim story, or as something different. Here’s a challenge for those who choose not to come in a traditional Purim costume: be prepared to say which Purim character your costume most resembles! Who will you be–a hero or a villain, a queen or a king, or perhaps someone else from the Purim story? Classes will be learning about the Purim characters, so that might help you to decide. Our Purim Tefilah service that morning will include excerpts from the Purim Spiel (Shalom Shushan!) and students will get to sing in the show! We’ll be reading from the Megilah and singing traditional and parody Purim songs. The morning concludes with hamantashen in the social hall. As I write this, plans are still underway for our school Passover celebration on April 17. Also please note, we DO have school on April 10: this was originally scheduled as a vacation day, but we are using this as a make­up for the snow day we had earlier this year. Please join us for the last two Family Services of the year–March 11, led by Grades 2 and 3, and April 1, led by Grades K­1. Our youngest students are busy learning songs and planning their presentations. 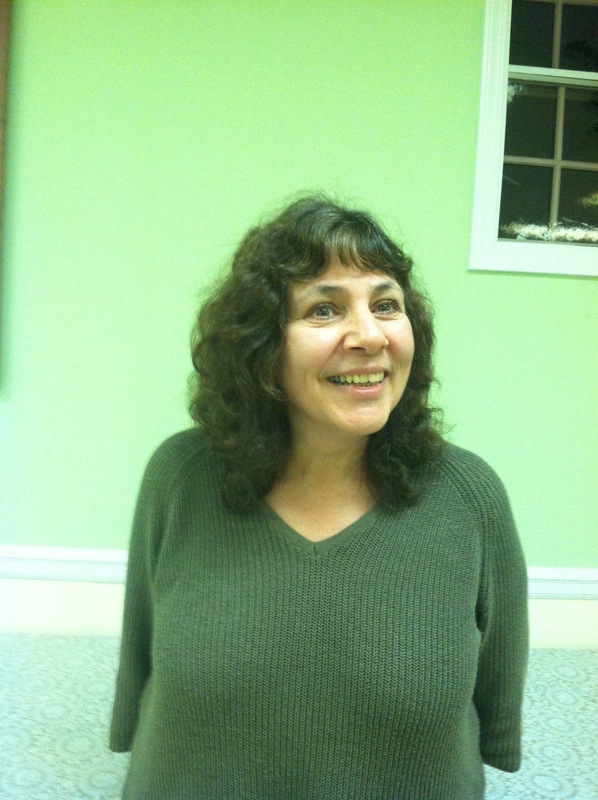 7:00 PM: Congregational Purim Service, Megillah reading & Spiel (Shalom Shushan!) Costumes encouraged! The bedrock of a flourishing democracy is the informed consent of the governed. If Sy Sym’s slogan that “an educated consumer is our best customer” is true for business, then “an educated civilian is our best citizen” is true for politics. If the Talmud famously teaches: “Every debate that is for the sake of heaven”—machloket l’shem shamayim—“will make a lasting contribution,” it also warns that “Every debate that is not for the sake of heaven will not make a lasting contribution.” Our sages understood that debate for the right reasons enhances the community. Debate for the wrong reasons diminishes us. That is why I so lament the sorry state of debate in our nation. It seems like things have gone from bad to worse. I’ve watched every debate, and my sinking feeling at the beginning of each televised travesty generally ends in depression. Millions of Americans are tuning in hungry for elevated conversation, only to walk away sated by a meal of junk food. As Fergus Bordewich writes in America’s Great Debate, his book on the lofty abolition arguments of the mid-19th century, “The pool-tested, spin-doctored, shoddily argued and grammatically challenged ‘messaging’ that today passes for political communication is pathetic and often incoherent by comparison.” And that was before the spectacle that passes for debate this election cycle. At their first debate, more than 10,000 people stood listening to Lincoln and Douglas for the entire three hours—there were no seats or bleachers. Similar crowds showed up for the next six debates, which were of such national interest that they were “broadcast” live by stenographers, who raced from the debates at set intervals with transcripts made in shorthand, which were then written out and conveyed by telegraph. Douglas began by acknowledging how significant debate was for addressing “the leading political topics which now agitate the public mind.” Abraham Lincoln opened his reply in feisty style: “When a man hears himself somewhat misrepresented it provokes him, but when misrepresentation becomes very gross and palpable, it’s more apt to amuse him.” Then, though, he got down to the serious business of educating the electorate about the ethical ills of perpetuating slavery. As a high school student, my experience on a nationally ranked debate team was profoundly enlightening. As a rabbinical school student, I learned to cherish the passion for debate that courses through our tradition, and years later it prompted me to write a book on the subject. As a student of American history, I know that worthy debate does not weaken but instead strengthens us. We may need campaign finance reform, banking reform, immigration reform—but how about starting with presidential debate reform? The kind of reform that goes beyond sound bites and sniping to affirmation, in the words of Rabbi Jonathan Sacks, of “the dignity of difference.” Who knows—in the process we may not only gain a greater appreciation our marvelous diversity, but also the realization that what unites us is greater than what divides us. 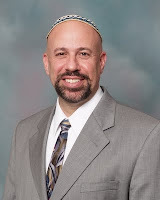 The previous post on our congregational blog, America's Zayde, featured my op-ed from the February 12th issue of the Jewish Standard, where it appeared under the title of Zayde for President. And in the post, I made reference to another Sanders, Edward Sanders, no relation to Bernie, and not to be confused with the English movie star. The Ed Sanders I'm talking about is described on Wikipedia as, "an American poet, singer, social activist, environmentalist, author, publisher and longtime member of the band The Fugs. He has been called a bridge between the Beat and Hippie generations. Sanders is considered to have been active and 'present at the counterculture's creation'." Originally from Kansas City, Sanders took up residence in Greenwich Village towards the end of the fifties, and among his many other activities, opened the Peace Eye Bookstore on the lower east side in the early sixties, an important center for the local counterculture. He also is the founder of the investigative poetry movement in the seventies. I pick out these points from his biography, which in truth are overshadowed by many other achievements, because they are relevant to the point at hand.been active and 'present at the counterculture's creation'." The point being one of his poems in particular, "The Yiddish Speaking Socialists of the Lower East Side," which I quoted a few lines from in my op-ed. The poem tells the story of an important chapter in the history of the United States, New York City, American politics, and the Jewish-American experience. The focus is on the first two decades of the 20th century, and the rise and fall of a democratic socialist movement spearheaded by the Jewish immigrants living on the lower east side. The poem concludes with the failure of that movement, but its influence was felt, in part through the participants that were still alive in the postwar period, in the protest and counterculture movements of the sixties, especially as one of the main centers of the movement, as it was called back then, was in Greenwich Village and New York's lower east side. Perhaps these things run in cycles, so we're seeing a revival of that sensibility from the turn of the 20th century and mid-20th century today in the teens of our new century. Whether that's the case or not, the poem provides a quick and easy way to understand the milieu that Bernie Sanders come from, both the politics of his parents' generation and the political movement that he took part in as a young man. The poem also communicates in a clear and stylish manner what democratic socialism is, and was, about. Not communism, socialist dictatorships, or totalitarianism. It was about human rights, many of them rights we take for granted today, rights denied to working people at the beginning of the century. I would suggest that it is vital to avoid having knee-jerk reactions to particular words, and instead try to understand what people really mean by them, and that includes socialism. From that perspective, I find it personally heartening to see how that term has been rescued and resuscitated in Bernie's election campaign. In the words of Franklin Delano Roosevelt (who many believed to have been a socialist), "the only thing we have to fear is fear itself," and that is especially true when it comes to words. So, now, I am pleased to give you two options for accessing "The Yiddish Speaking Socialists of the Lower East Side" right here and now. You can read the poem on the online Woodstock Journal that Sanders maintains, here's the link: The Yiddish Speaking Socialists of the Lower East Side. <Or you can listen to a semi-musical recording of Sanders reading the poem, accompanied by an electronic instrument of his own invention, the Bardic Pulse Lyre. The recording was originally put out on vinyl, but there is a nice YouTube version with the printed words as the visuals, so you can enjoy the best of both words worlds. I would suggest that this poem is quite helpful in understanding where Sanders the candidate is coming from, and perhaps also why his campaign is not reducible to simply winning or losing caucuses and elections.Whatever your own political views may be, I think it is important to understand this chapter in American and Jewish history, and to understand the background that the first major Jewish candidate for President of the United States comes from. Of course, the views I've expressed here are my own, and not the views of Congregation Adas Emuno. When Larry David hosted Saturday Night Live on February 6, Bernie Sanders made a surprise appearance during a skit about a sinking ship — an apt metaphor, some might say, for the state of the union. With David playing the part of a rich man arguing that his wealth earned him a spot in the lifeboat along with the women and children, Sanders was given the opportunity to deliver a few lines about the one percent “getting preferential treatment,” and the “need to unite and work together.” A brief exchange regarding democratic socialism followed, leading David to ask, “Who are you?” Sanders replied, “I am Bernie Sanderswitzky — but we’re gonna change it when we get to America, so it doesn’t sound quite so Jewish.” “Yeah, that’ll trick ’em,” David shot back sarcastically. And certainly there is no disguising the fact that Sanders is Jewish, although this was one of the rare moments in media coverage of his campaign for the Democratic presidential nomination that any mention has been made of his ethnic and religious identity. And that arguably is odd, given how much emphasis was placed on the fact that Barack Obama became the first African-American president, and on Hillary Clinton potentially becoming the first woman to be president. Maybe it seems that by contrast with African-Americans and women, Sanders becoming the first Jewish president would be less of a monumental breakthrough for the nation. Maybe it has something to do with the fact that some Americans believe that we already have a non-Christian president—that Obama is a secret Muslim. Or maybe it’s a matter of longstanding Jewish reticence, as reflected in the name change mentioned in the skit. Sanders is a traditional Anglo-Saxon name; interestingly enough, it originated in the same impulse that was prevalent among the Jews of antiquity, to name their children after Alexander the Great. Of course, Sanders’ self-identification as a “democratic socialist” often is referenced by the news media, as it was on the Saturday Night Live skit, but would that make him the first socialist president of the United States if he is elected? Not according to Republican rhetoric, given that most Democrats have been accused of promoting socialist policies. More significantly, not according to Sanders himself, who positions himself in the tradition of Franklin Delano Roosevelt’s New Deal programs and policies, as extended by John F. Kennedy and, significantly, by Lyndon Baines Johnson’s Great Society initiatives. Those presidents avoided the label of socialist, however, given American opposition, from the Russian Revolution on, to the Union of Soviet Socialist Republics, even during the brief period we fought together to defeat Nazi Germany. of the Lower East Side. As the poem explains, they had, “a passion for Justice that never fades away,” although they failed in their efforts to translate their ideals into a successful political revolution. Ed Sanders, who is just two years older than Bernie, was an icon and leader of the counterculture of the ’60s and early ’70s. Although he was not Jewish, he took inspiration from the social justice activism of these early 20th century pioneers. Movements like these seem to run in cycles, so it may well be that the socialism that arose at the turn of the 20th century and returned in the form of the counterculture over half a century ago is due to make a comeback now. Without a doubt, the counterculture movement also was a youth movement, and not surprisingly, Bernie Sanders has enjoyed widespread support among the youngest of our eligible voters, the generation referred to as Millennials. Indeed, this has been a frequently invoked theme in news coverage of the campaign, with the pundits often seeming at a loss as to why twenty-somethings would support a 74-year-old candidate. The expectation that young people automatically should favor the youngest candidate perhaps has its roots in the fact that baby boomers venerated John F. Kennedy, who was the youngest person ever elected president, but this overlooks the fact that no one from that generation was old enough to vote in the 1960 election. As much as JFK’s appearance of youth and vigor seemed to resonate with the ascendancy of the boomers, we have no way of knowing how that generation would have regarded him had his career and life not been cut short by an assassin’s bullet. We do know that his successor, LBJ, was vilified for his escalation of the Vietnam War, and that happened despite his progressive domestic initiatives. In the same sense that political movements may be cyclical in nature, so too are filial relationships. That’s why we often speak of traits and qualities skipping a generation. Millennial support for Sanders therefore should come as no surprise, as he easily fits into the role of America’s grandpa, or more accurately, America’s zayde. Often he comes across as a grumpy grandpa, as Amber Phillips of the Washington Post suggested last July. But Emma Roller of the New York Times labeled him “your cool socialist grandpa” in December, and just a few weeks ago, People profiled him as a “fun grandpa,” according to his own grandchildren. Jeb Bush, who had been struggling to gain the slightest bit of traction, recently had his mother, former first lady Barbara Bush, venture out into the New Hampshire snow to help him in his primary campaign. The news media has made frequent reference to her enormous popularity, referring to her as “America’s grandmother.” And there is no question that she fits the image, and did so even back when her husband was president. Hillary Clinton, on the other hand, has included the fact that she recently became a grandmother as part of her campaign rhetoric, but she has not been able to come across as particularly grandmotherly, drawing criticism this past December for comparing herself to an abuela (Latina grandmother). Grumpy, cool, and fun are not mutually exclusive traits, and there is something about the image of older Jewish men that plays well in contemporary American culture, and especially on television. It is indeed a mixture of idealism and humor, impatience with injustice, and infinite patience with the young. Whether this is a wining formula for the Democratic primaries remains to be seen, but the source of his appeal to Millennials, as a socialist zayde, should not be a mystery.